Auktorisoidut mieskuorosuosikit (...) Musiikillisesti täysipainoisissa tulkinnoissa riittää haastetta yllättävänkin paljon (...) Näihin haasteisiin Matti Hyökin johtama YL pystyy vastaamaan. Helt oumbärlig för den tvåspråkigt sinnade, valborgsfirande manskörsälskaren. This CD conveys to the listener the full panoply of Finnish life and the joy of spring awakening after harsh winter times. 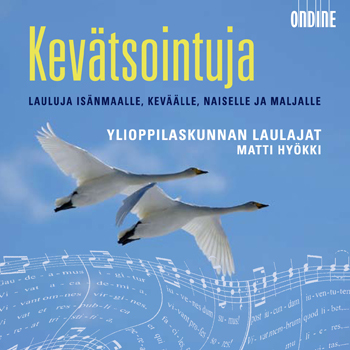 The album is named after the featured song Kevätsointuja (Spring Tunes). The famous Helsinki University Male Choir "Ylioppilaskunnan Laulajat" under the direction of Matti Hyökki has recorded these songs which form an integral part of traditional Finnish student culture. Academic songs are coupled with patriotic songs, drinking songs, and love serenades. Known to every Finn, they are sung in particular on "Vappu" Day (May Day) - traditionally a commemoration day of the students though it has absorbed most of the population in some way or another. In addition to the Finnish and the Swedish language, some songs use German or Latin, such as the presumably most famous international student song: Gaudeamus igitur - "Let us rejoice therefore!"